It's all about attitude, originally uploaded by The Bacher Family. 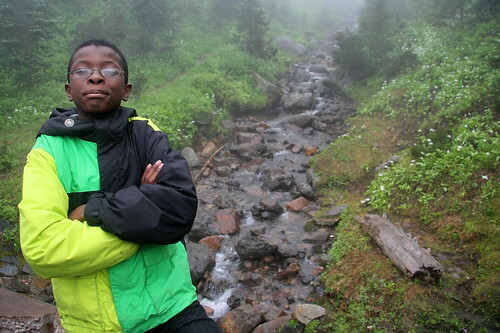 This young man was part of our fourth Camping Adventures with My Parents program of 2010 at Mount Rainier National Park. He loved having his picture taken, and he's posing the same way in each photo: arms crossed, chin up, a proud young man. He earned the attitude, too: the pin on his lapel is for volunteering to help out around the campsite, cleaning dishes, picking up trash, even helping to cook the evening meal. This is my favorite photo of him, because of the great contrast between his bright coat and dark skin and the muted colors of Deadhorse Creek in the fog behind him.